My quilt bee quilt is finished! And isn’t she purdy? I named this one “Cropshoot”. It is headed to my friend Erika. And Erika has successfully grown her own vegetables for a few years now. She’s my garden hero. I want a garden like her’s. Back to ‘cropshoot’ – it was the title of her garden blog. And putting this together was a bit of a crapshoot, so why not? 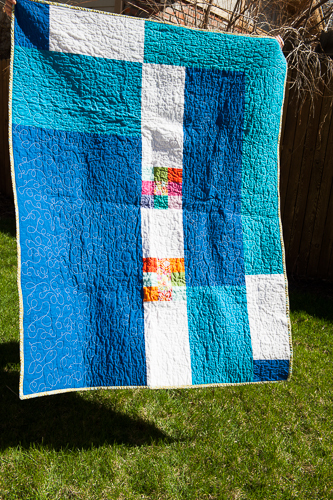 And by crapshoot, I meant the quilt design. I toyed with setting the blocks on point, or doing an asymmetrical arrangement. But in the end, I opted for a simple grid. I think I’m missing a few blocks from a bee member (or two), but I’m not that concerned. 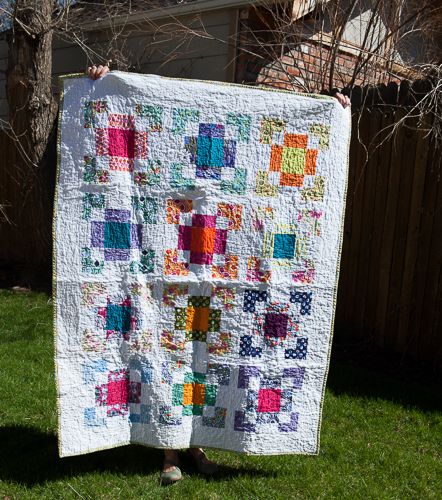 I ended up making a few more blocks to bring it to an acceptable lap sized quilt. I pieced the back with whatever solids I had enough of at the time, adding in a couple 9-patches to break it up. The quilting was done in a random, all over the place meandering. And here’s a first: I made bias binding. I used the continuous bias binding method. A method I made way more complicated than necessary. The binding is completely machine stitched in case you were wondering. Fresh out of the dryer, all wrinkly and soft.